Never have potatoes been so sublime; there was a fight for every single morsel. Part of the trick is to get the right potato and we used the classic Irish Rooster to great effect. 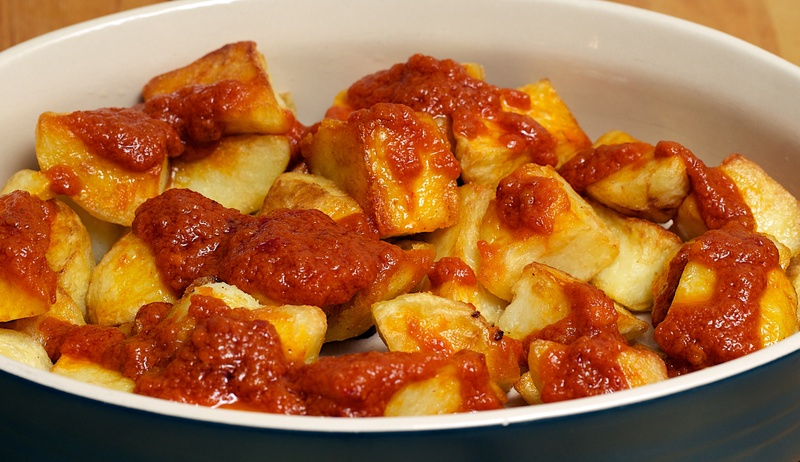 You will have too much tomato sauce which you can put in the fridge or freezer to make patatas bravas again another night; we did just that and ate Patatas Bravas three times during the week! Wine Suggestion: This dish is perfect for a nutty Amontillado sherry and make sure it is dry as the commercial “medium” sherries just won’t do! A classic Tapas & Sherry match which we wholeheartedly endorse. Yum! I absolutely love fried potatoes… And with a description like “Never have potatoes been so sublime;….” how can I but not make these soon? Agreed, we have been thinking the same thing and might just have to make them again this weekend.